Heat pumps are now a realistic option for any home' in any climate. The new MSZ-FH family of Hyper-Heating INVERTER residential systems offer year-round' high-efficiency cooling and heating for a variety of rooms' including bedrooms' basements' sunrooms and more. 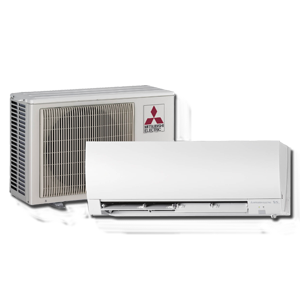 The slim' wall-mounted indoor units provide zone comfort control while the INVERTER-driven compressor and electric LEVs offer higher efficiency with controlled power usage. Industry-leading efficiency of 30.5 SEER (MSZ-FH09NA). Hyper-Heating performance down to -13dF outdoor ambient. 100% heating capacity at 5dF outdoor ambient. Double-vane air delivery for enhanced circulation. i-see Sensor 3D: Infrared human sensing technologies to measure location of human heat signatures. - i-see sensing floor temperature to deliver conditioned air to those areas by double-van airflow.